These courses follow an internationally recognized curriculum. If students pass the exam at the end of the course with a score of 3 or better, they will earn college credit, which is widely accepted by colleges and universities. Last year, 139 exams were passed, earning our students approximately 450 hours of college credit. 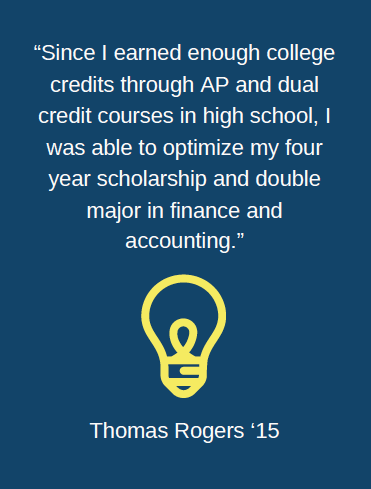 The AP path offers students true college preparedness. Students with passed exams can feel confident that they’ve conquered college level work. Our senior math teacher is certified to teach college level courses at Bethlehem. Students may earn credit for algebra, trigonometry and calculus. The credits from Campbellsville can then be transferred to another university. The supplemented tuition from the state of Kentucky and the seamless integration into a student's schedule make this option accessible to all seniors. Each semester, WKU offers about ten online courses in introductory college subjects. Our students can substitute one or more of these for their high school coursework and earn credit from both schools. This is a great option for students who like to work independently.